Here I am with my Saturday entry for Wicked Wednesday. I chose this Stamping bella stamp that an internet friend of mine from Germany traded with me last year for some of the Stamping bella's that I had. It's so cool that you can make friends from all over the world without having to pack and get on a plane, train, or in a car. 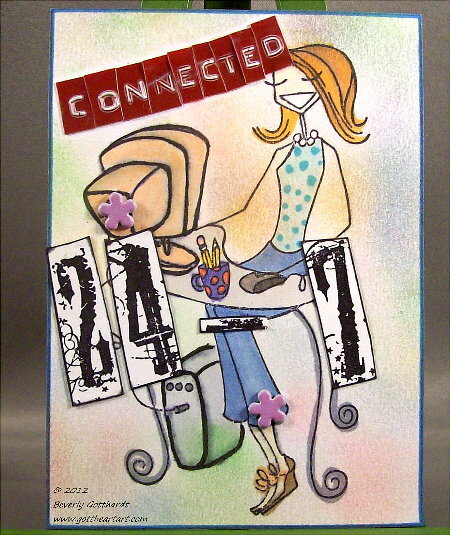 I used Copic markers, chalks, a label maker, a Tim Holtz stamp, and a couple of tiny flower brads. 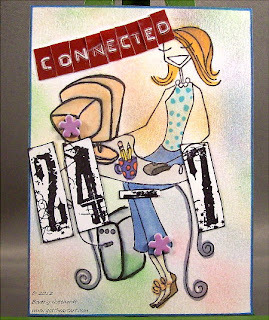 There's still time to enter a little piece of ATC goodness, see you at Wicked Wednesday. Fabulous! Love it! Connected 24/7 - how true. hee hee Thanks for joining us again at Wicked Wednesday, Bev! Bev this is great - very clever & great for our Wicked Wednesday Challenge this week!!! A Techno Geek?!! LOL! Too Cute! So glad you had the chance to join us at Wicked Wednesday this week...thanks for playing along with us.